Are BT shares a good investment? The last time I looked at BT shares in any detail was 2012, and at the time I wasn’t exactly gushing with enthusiasm. I thought the company’s results were lacklustre, the valuation so-so and the yield unimpressive. I didn’t invest. So was I right to avoid BT and, more importantly, are things looking any better today? The company had consistently produced profits and dividend payments, but the dividend had been cut in the financial crisis and there was no obvious growth trend. With such uninspiring financial results it was fairly valued at best, given a valuation and yield approximately equal to the wider market. To put icing on the cake the company had fairly substantial financial obligations in the form of both borrowings and pension liabilities. It’s no surprise then that I declined to invest, which means I missed out on the 80% plus total returns that BT shareholders have enjoyed since then. So what happened to produce such good gains in less than 2 years? Some of the gains came from the dividend. With the yield near 4% in 2012, investors have received around 8% in dividends since then, but the remaining gains of around 75% have come from the capital side of things. Again, this has been driven to some extent by the dividend. In 2012 the dividend stood at 8.3p while today it’s some 31% higher at 10.9p. The share price would have had to go up by 31% just to keep the dividend yield at that same 3.8%. But that’s only 31%; where did the remaining capital gains come from (another 44% to be precise)? The answer is improving market sentiment, or if you want to put it another way, expanding valuations. Investors are happier about BT today than they were in 2012 and so they’re willing to accept a yield of just 2.7%. To decrease the yield from approximately 3.8% to 2.7% you need to increase the share price by that missing 44%. Overall then BT shareholders have had about 8% in dividends, 31% from dividend growth and 44% from expanding valuation multiples. Revenue growth has been around -1.5% a year and profit growth has averaged a measly 0.1% a year, both measured over the last decade. Even if we focus on the most recent couple of years which cover that 30% dividend growth I mentioned before, profits have gone up but revenues have not; and that’s a problem. Revenues have been flat, in nominal terms, for a decade at least. Clearly there can be no long-term growth if a company’s top line isn’t growing. Of course there are programs and projects underway within the company to grow and increase shareholder value, but isn’t that always the case? And if the company hasn’t managed to grow in the last 10 years how can an investor reasonably have faith that it will be able to grow in the next 10 years? 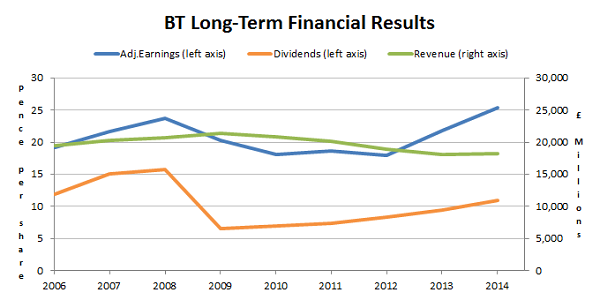 As far as I can see BT has continued its post-recession recovery, but nothing more. I don’t see any evidence yet of long-term sustainable growth, so I don’t think I was wrong in 2012 to think that BT wasn’t attractively priced at 221p. And that begs a question: If I thought they were expensive at 221p, what do I think of them now they’re at 400p? In 2012 the market valued BT in line with most other large companies, despite its somewhat disappointing financial results. Things are different now and the market is definitely optimistic. The dividend yield, at 2.7%, is well below the yield on the FTSE 100 or All-Share. I can get 5.3% from Vodafone, or 3.9% from standard chartered. The market must be expecting BT to significantly outgrow those and many other higher yielding companies, even though there is no evidence for growth in the company’s past. In terms of earnings, BT’s PE10 ratio is 19.5, well above the FTSE 100’s 14.5. Using my stock screen I can see that 40 of the dividend paying companies I track have PE10 ratios of between 18 and 22, and on average they have grown at 6% a year and have an average yield of 3.3%. So on average they’re growing faster and yielding more than BT, which is perhaps a less than subtle hint. And those financial obligations are still there. Total borrowings currently stand at £9.8 billion compared to average earnings after tax of £1.5 billion over the last decade, and total pension scheme liabilities stand north of £20 billion. Yes, that’s 20 billion pounds. There is also a deficit in the scheme of around £7 billion which needs to be filled from cash which will be a drain on resources, as it has already been for a long time. With BT I think the company offers mediocre growth, quality and safety at best. To be an attractive proposition it would need to be selling at a discount to the market rate, which it currently isn’t, and so it doesn’t offer good value or a decent yield either. Unless the share price collapses from 400p back down towards 300p (and preferably 250p), I don’t think I’ll be investing in BT shares any time soon. Disclosure: As I mentioned Vodafone I should also mention that I own Vodafone shares and Vodafone is a holding in the UKVI Defensive Value Model Portfolio. Fair enough I still have some BT shares, although I sold the majority in April. First I bought BT in 2012 when I have seen the opportunity BT will have in the digital space. I have added when I sold BSkyB after the Murdoch scandal in 2013. They did not disappoint me. The company worked hard, launch its sports channels, video on demand, Infinity broadband all good products with good margin. Are the share expensive now? Probably they are. All they need now is a visionary CEO who has lots of guts to take Vodafone private or merge with BSKyB subject to regulatory approval. For this they need real guts, very big guts. Another option is to try to leverage their sport channels in the Far East doing small acquisitions. How do you envisage the situation now that BT has(will) moved on and acquired 24 Million EE customers? Debt will increase further, but then there is the profitable business from EE to add to the pile. Bearing in mind that mobile service revenues are and have been in decline for some time. This puts a big question mark over an investment in either BT or Vodafone although their valuations differ for very different reasons. Vodafone’s P/E (whilst yes short term possibly) dwarfs BT and pension liabilities and debt are much lower. But then again Vodafone isn’t growing it’s revenue either? The EE deal doesn’t change my thinking at all. I don’t try to envision anything about the future other than that it might look roughly like the past. So all of these issues surrounding BP and EE are just speculation in my opinion, much like wondering which way the wind will blow a month from now; the answer of course is that nobody really knows. Or at least, I don’t which is why I focus on the past rather than the future. EE will become part of my BP analysis when it filters through into the company’s reports, and even then it will only make a significant difference after a few years. So I’m in no rush to change my opinion just let. BP is still very much off limits for me.